On the penultimate Sunday before the Loop, we had eight intrepid runners (Ciorsdan, Lee, Aarti, Virginia, Brian, Chrissy, Patty, and Rob) on this perfect day for a run in the woods. Loop founder Tony Godino came to send us off which was an unexpected treat! The trails were the driest seen all season. There was still plenty of mud on the trails, but it was a bit easier to avoid than in prior weeks. We headed out along the Deer Hollow trail that goes alongside the Waccabuc River and then joined up with the Loop course at about the 4 mile mark. Since we had done just under a mile to get there, it felt very different than it will in less than 2 weeks. The long gradual Deer Hollow Hill goes on for just under a mile into the Pine Forest section of the course and then downhill to the switchback at the river. The Brown trail becomes the course at this point, following the river on the north side. It leads out towards the Splashdown (second water crossing) and the Meadow finish. The water level has lowered considerably back to normal seasonal levels but we opted for the bridge near the park offices. As it turned out, Sunday morning was the only time the Loop organizers could get together with the Park management to go over last minute details and logistics. Rob peeled off to attend that meeting while the rest of the group headed into the woods via the Fox Hollow trail, Brown Trail (riverside) and then up the Brown Trail Hill (steep!) back towards the Town Park. Next week is the last group run Sunday before the Loop and we’d like to try our hand at the entire 6.2 mile Loop course in a ‘wet run’ (i.e. we will be doing the water crossings, rain or shine). 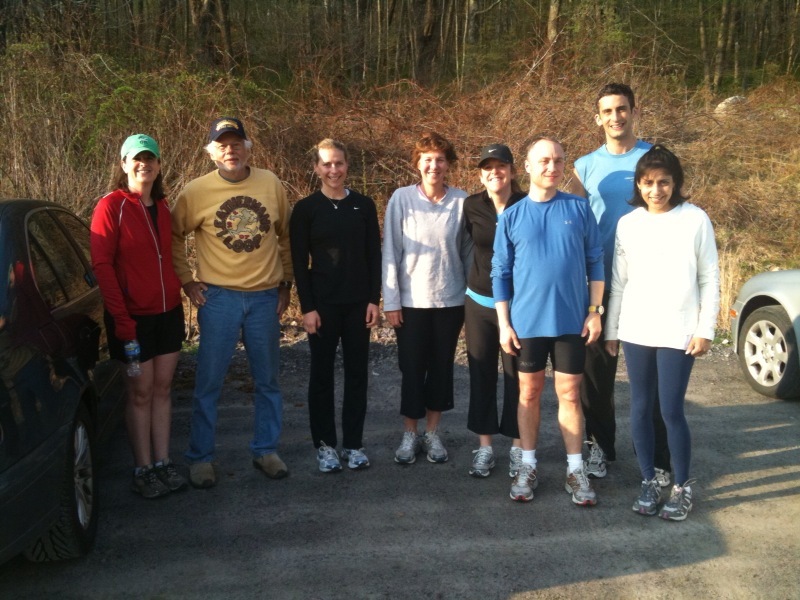 Meet at the Meadow Parking Lot at Pound Ridge Reservation at 8am Sunday April 18th and we will run the whole Loop course if folks are up for it (there are alternate routes if anyone wants a shorter run). It won’t be a race, just a group run to check the terrain and conditions. Hope some folks can join us! The past six weekends have been fantastic and very motivating. I hope those folks who joined in enjoyed the experience.